No blueberries this year. What a big disappointment. Last year when my parents visited at the beginning of August, they went out blueberry picking every day and filled my freezer with endless supplies. Flash forward to one year later and the bushes are all empty. No harvest time for my parents. Except for one time, when they came back from their afternoon walks in the neighbourhood with some raspberries. This called for another berry pie. Something that I had been planning to make for some time was custard tarts. It had all started some time ago making custard together with a friend. A total failure: it had come out too runny. So I tried again, and that time I exaggerated with the starch and made it so thick it wouldn’t spread. Well, practice makes perfect, right? 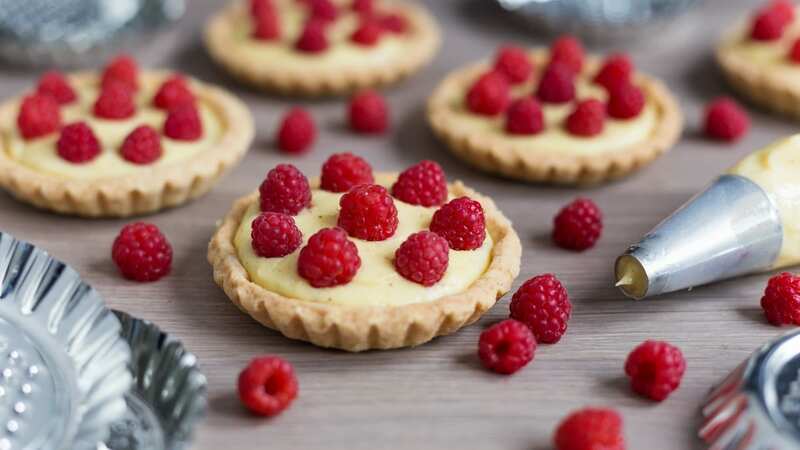 So my third attempt, when my parents unloaded a bucket-full of raspberries on my table and I decided to make raspberry custard tarts, the custard finally came out much better. So here’s the recipe for the best custard I was able to nail so far; the shortcrust recipe follows. Pour 200 ml of milk in a saucepan, add the vanilla and set on the stove on medium heat. In the meantime, separate the egg yolks from the whites. You can discard the whites, or keep them for later recipes, such as Swiss meringue buttercream or macarons. Combine the yolks with the sugar, cornstarch and 50 ml of milk. Beat with a hand mixer for a couple of minutes while the milk is warming up. When the milk is about to boil, pour the yolk mixture in, lower the heat and stir (preferably with a hand whisk) until it thickens. Keep stirring until the mixture boils, then remove from heat. Cover the cream with cling film and let cool to room temperature. 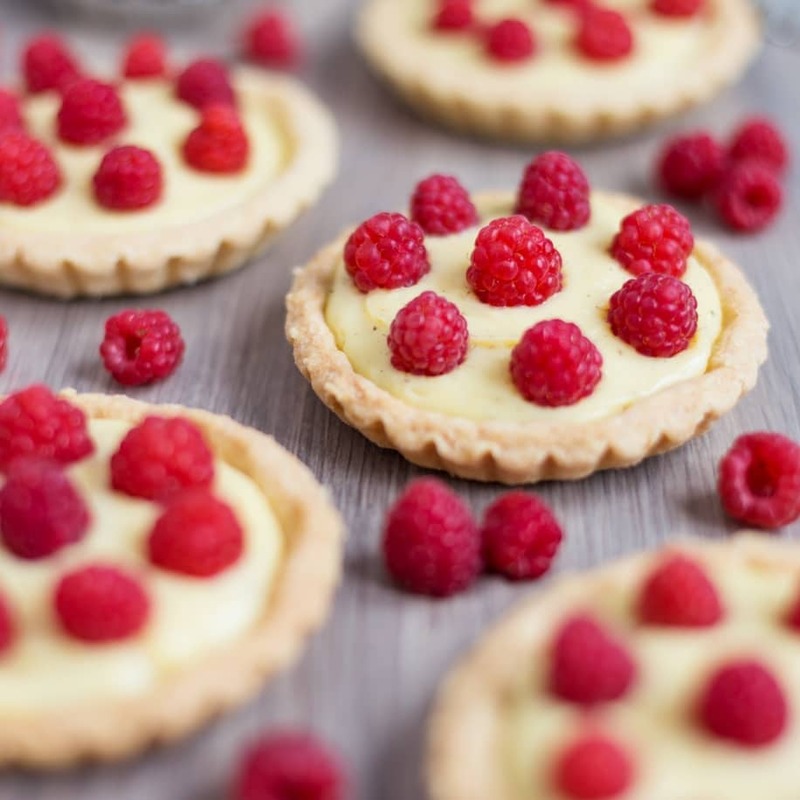 It is delicious to eat warm, but when used with fresh raspberries it is best cold. While the custard is cooling, it is time to prepare the pie crust. In a large bowl combine the flour, sugar ad butter and mix with a mixer at high speed. When it all breaks down to coarse crumbs, add 2-3 tbsp of cold water and keep mixing until the dough comes together. Wrap the dough in cling film and chill in the fridge for a half hour. 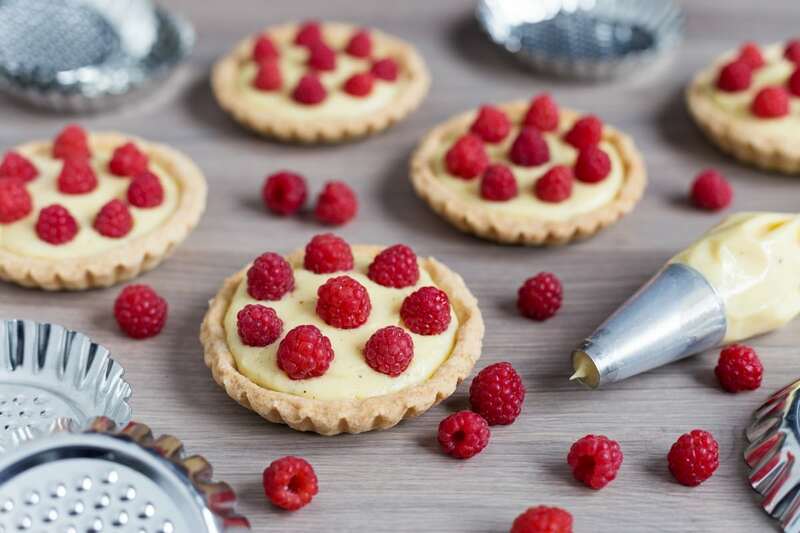 After that, roll out the dough, cut out circles and and place them in mini tart forms. Cover the shortcrust with parchment paper and place dried beans all over the flat surface of the shortcrust shells. The weight of the beans will prevent the bottom of the shells from rising, keeping them nicely flat. Bake in the preheated oven at 180°C for 20 minutes, or until lightly golden. 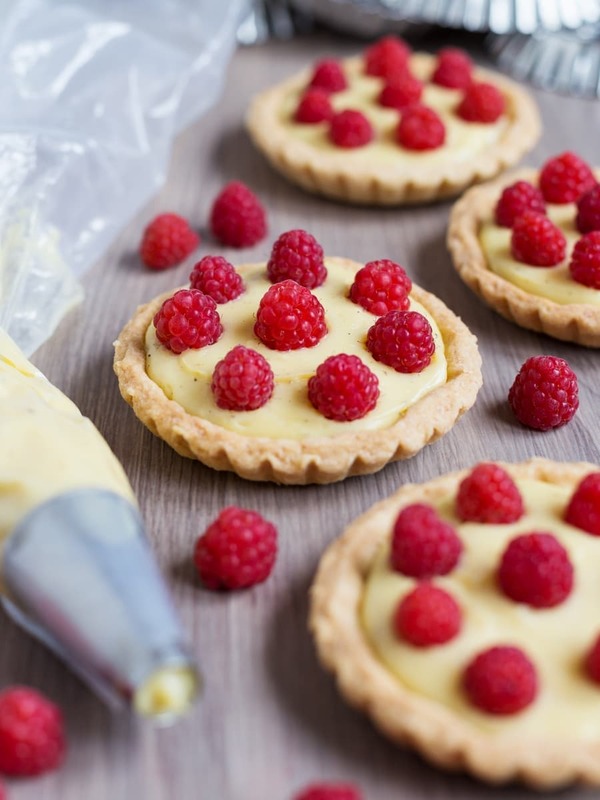 When both the shortcrust shells and the custard have cooled to room temperature, fill the shells with the cream (I used a pastry bag to fill them, then a spatula to even the custard out) and decorate with fresh raspberries. 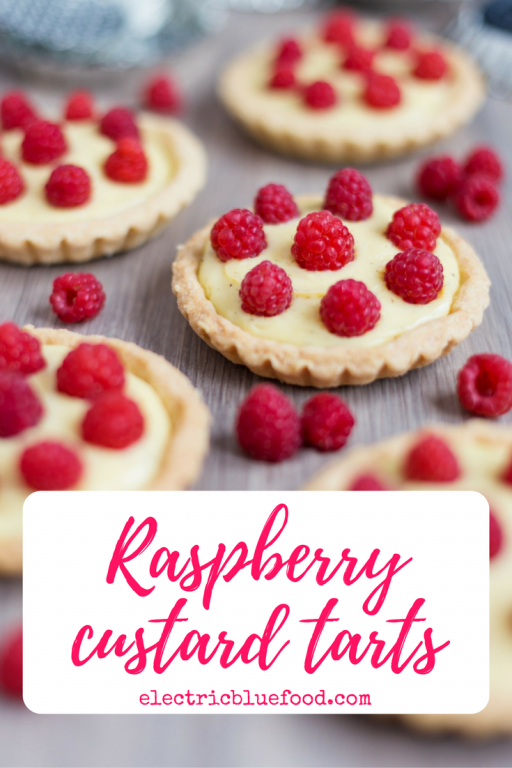 Although these raspberry custard pies can be preserved in the fridge and consumed the following day, in my opinion they taste better immediately. Unlike many baked goods, that often taste better the following day, I find pies to be at their best when they’re fresh and the filling has not yet moistened the crust. Nothing beats the contrast between the soft cream and the crunchy shell. 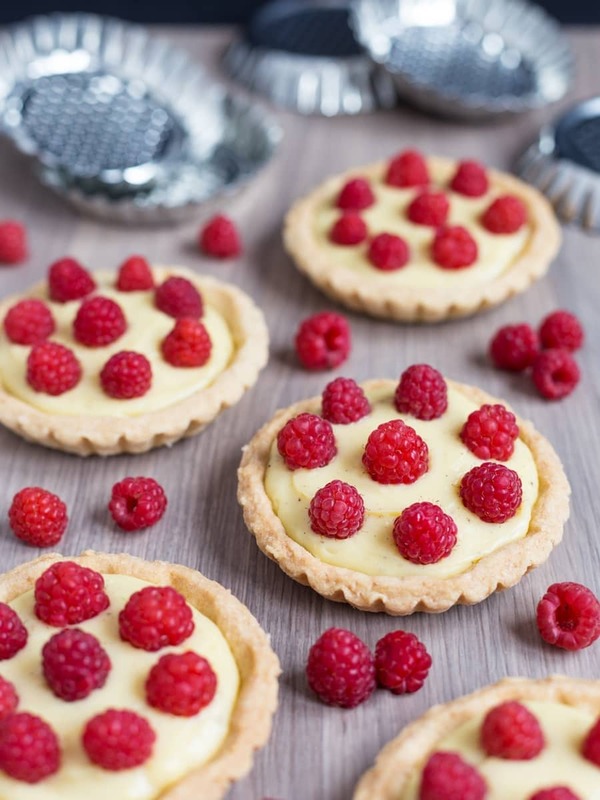 Now..I think I know what I can do this weekend, looks a wonderful tarts and great recipe. I will try it out! Thank you! Tu non puoi vedermi, ma ho gli occhi a forma di cuore. Salvo la ricetta ed appena possibile la provo, sperando di riuscire a reperire i lamponi ad un prezzo umano!